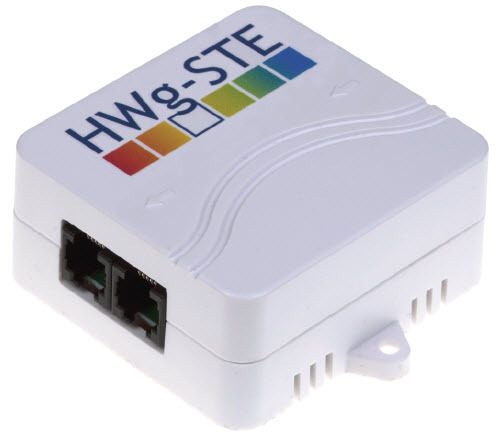 HWg-STE is an ethernet thermometer by HWg. Up to two temperature/humidity probes can be connected. 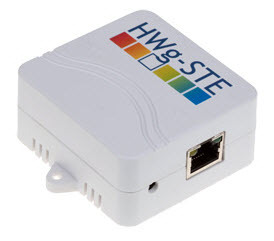 Supplied with temperature probe, power adaptor and software. Perfect for in-cabinet installations where space is short or where you need a lot of climate monitors at a low price. When integrated with the iMCA System, you can not only remotely monitor temperature and humidity of almost any place in the world but also create virtual connections with any switches registered in the iMCA System such as static, pulse, IR, security arm or disarm etc. You can easily create and execute any number of automation scenarios based on temperature or humidity readings from this free service. Using this device and the iMCA System you can affordably build effective Climate Control solutions and receive alert notifications via email and SMS when desired environmental thresholds are exceeded. Waterproof, stainless-steel temperature probe, -30°C to +125°C (-22°F to +257°F). Temperature probe with 1m / 3m / 10m cable.